Editor's note: This is an SFGate.com In The Mission Blog. These blog posts are not written or edited by SFGate or the San Francisco Chronicle. The authors are solely responsible for the content. 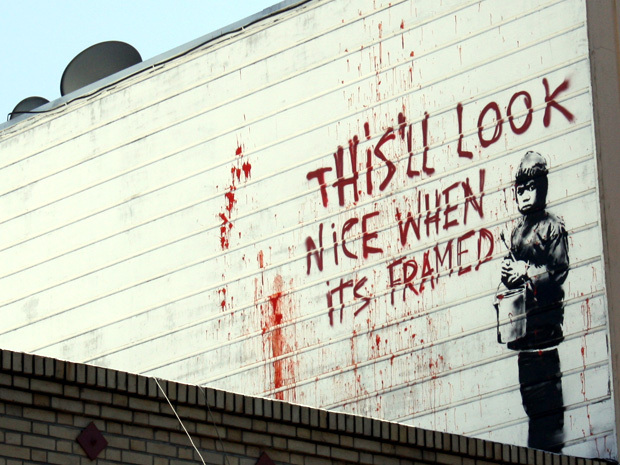 A new quasi-verified mural attributed to the notoriously anonymous Banksy materialized above Amnesia Bar on Valencia Street some time Wednesday, according to art snoopers, enthusiasts and nearby shop owners. Street art and local blogs hypebeast, fecalface and sfist have all been atwitter at its appearance, along with another Banksy piece in Chinatown. San Francisco-based art blogger Mike Cuffe, who broke the story on warholian.com, even took it upon himself to pronounce the work legit. More Banksy murals are being spotted throughout the city as well. Though some discussion lingers over whether the pieces might have been done by a copycat, street art aficionados have been making pilgrimages to both sites. "I came specifically out today," said Andrew excitedly. He drove into the city from Hayward just for this. "You never know when someone is going to take it down or paint over it. This is an amazing opportunity. It's awesome." Learn how to share your comments on Facebook. The latest information on schools, restaurants, real estate, events and sports from The Mission's finest local bloggers. Where Are the Muni Assistants? © 2010 Hearst Communications Inc.